As part of St. Jude Memphis Marathon Weekend presented by Juice Plus and Memphis Runners Track Club, AutoZone Park for the 12th consecutive year will host more than 20,000 runners and walkers for five races benefiting St. Jude Children’s Research Hospital. Ten Memphis Redbirds employees are racing this year, including a five-member team assembled to participate in the Marathon Relay. Training and preparing for the race have been a rewarding and gratifying experience for the runners to benefit Team Ava. Ava is the daughter of an employee of Running Pony, a long-time partner of the Redbirds. 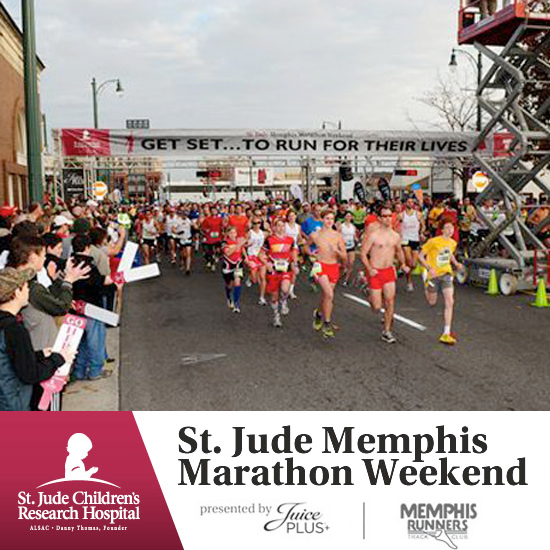 All proceeds from the St. Jude Memphis Marathon Weekend races benefit the lifesaving research and treatment conducted at St. Jude Children’s Research Hospital in Memphis. For detailed information about race weekend, please visit stjudemarathon.org. Runners and fans participating in the St. Jude Memphis Marathon Weekend who are on social media can follow St. Jude (@StJude) and AutoZone Park (@AutoZone_Park) on Twitter. Join the social conversation using #MemphisMarathon and #SJMMW.